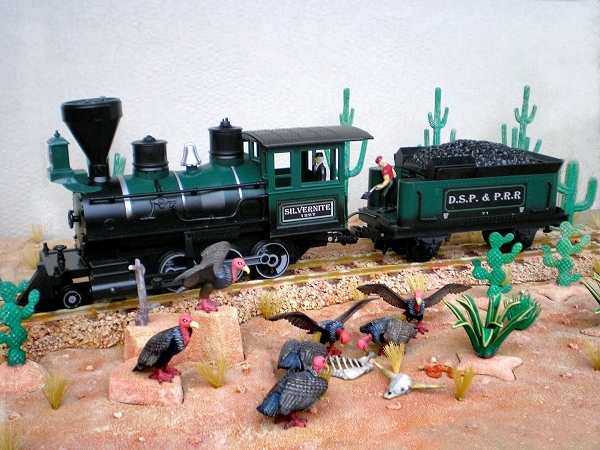 Since LGB revived garden railroading with its "G gauge" offerings, toy trains that claimed to be G gauge have been available in many department stores every Christmas. Technically, they do use the same gauge of track (45mm) that LGB trains use, but most of them are much smaller in scale, closer to O scale, and even, in a few cases, HO. New Bright, Echo, Scientific Toys, and many lesser known brands have appeared, powered by batteries and zipping around an oval of cheap plastic track. At least one friend will get upset when I call these toy trains, because he sees the value in even the cheeziest of them. But even he hasto admit that they pay no particular attention to scale and they take huge liberties with the "prototype," and they are made with much cheaper materials than true garden trains. They generally have a short life span for a number of reasons. 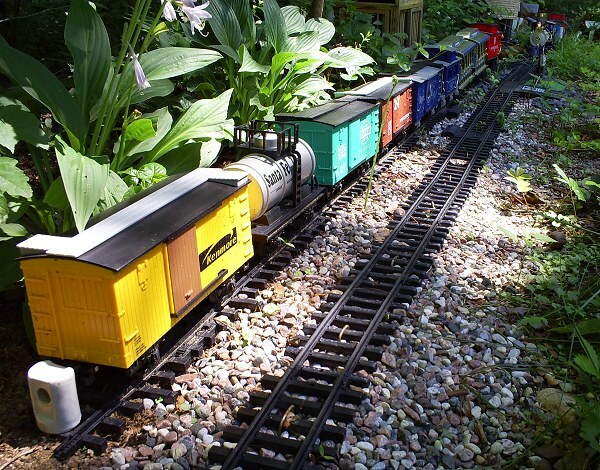 One is that most of them are not nearly as sturdy or weather-resistant as true garden trains. Another is that they're frequently given to children too young to operate the train properly without supervision. And the most damaging, they are often put away with the batteries inside, so that important parts have been eaten by acid the next time you get them out of the box. That said, they can be lots of fun, if you know what you're getting into and take proper care of them. Many of these trains have come into the hands of "big people" who appreciate them for what they are and are careful to use, maintain, and store them appropriately. And those trains are often the start of a "big train" hobby, as you can see in the photo to the right, from Hans-Werner Lienau, of Germany. Some of those trains even move outside, which is the focus of this article. Note: If you're specifically interested in garden railroading and you can afford a Bachmann or AristoCraft starter set, spend the extra money and get a good train to start out with. People who buy a $50 set to "try out" garden railroading are almost always disappointed for the same reason that kids whose folks give them a $50 guitar to "try out" never learn more than three chords - you can't make a $50 train look, run, and hold up like a real model train any more than you can make a $50 guitar sound and play like a real musical instrument. But if you already have one of these or you really can only afford to spend $50 or so on a train this year and you want to get the most out of it that you possibly can, this article should help you do this. 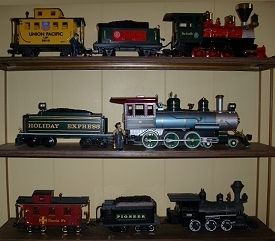 For good or ill, New Bright (shown on the bottom shelf) more or less set the standard for plastic, battery-powered trains that run on plastic track. Not only are their locomotives made of plastic, they look like they're made of plastic. Many of these trains including brightly colored plastic wheels with shiny paint on the spokes and rims. The entire train looks dinky compared to a real "G scale" (1:22.5) train (or even a 1:32 train). But their coaches (passenger cars) are even smaller, usually smaller than O scale. Most of the Echo trains I have seen are similar, if smaller. 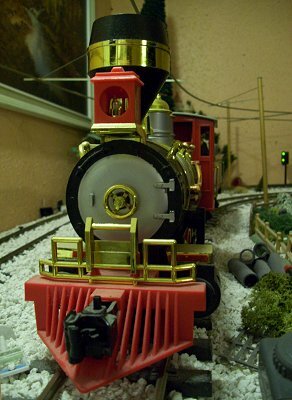 (Click here for an image of an Echo locomotive.) Most less-well-known brands are smaller and more cheaply made than either of those. That said, ANY train that runs can be fun to use and can be made more fun to use with a little extra effort. 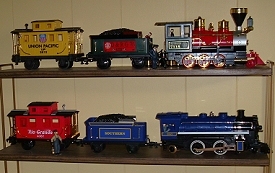 An exception to the "New Bright and cheaper" rule for these trains is "Scientific Toys' EZ-tec" line (shown on top shelf in the photo above). Though Scientific Toys' boxcars and gondolas are undersized and the track is still plastic, their locomotives and cabooses come closer to the height and width (if not the length) of scale trains, and they tend to be sturdier. In addition (Robert Taylor reminds me), most EZTec trains now come with a simple (walkie-talkie frequency) remote control that controls forward, reverse, stop, and sounds. 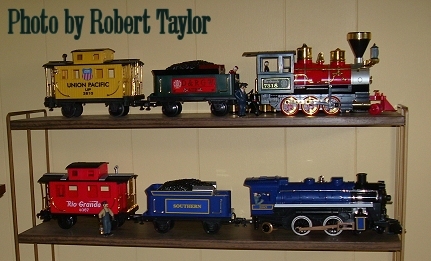 The photo to the right shows two more EZ-tec trains from Robert Taylor's collection. 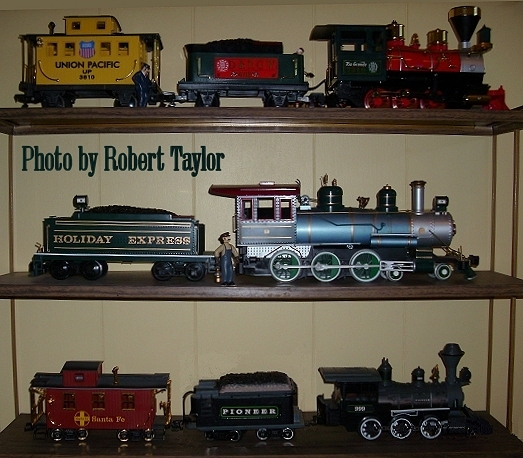 You can see that one follows the "Narrow Gauge," "Old-Western" tradition of most of the other photos on this page. The blue one, however, seems to represent a Standard Gauge, more modern locomotive. It is much smaller, closer to O scale (like most Lionel). 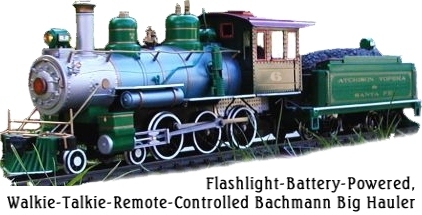 A few higher-end battery-powered, plastic-tracked train sets have been made, including the following. Lionel has also recently released at least three battery-powered so-called G-gauge trains, including mock-ups of the Polar Express and the Harry Potter Hogwarts Express . Although none of these are great models, they are in the better-than average category for battery-powered trains. More recently a 4-4-0 "Western-looking" "Holiday Central" Christmas train has come out; its locomotive looks something like a real 1850s 4-4-0, if a little foreshortened. 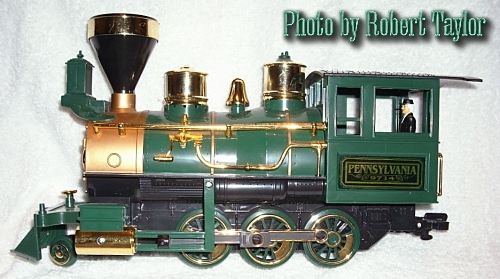 Update for 2010: We now have a review of the 2009/2010 Lionel "G gauge" battery powered trains based on the 2-8-2 they designed to pull the "G gauge" Polar Express. Click here for more information. 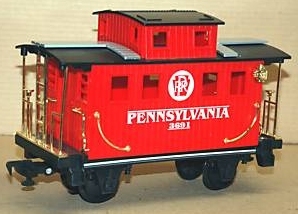 In the past, some of Lionel's battery-powered "G-gauge" Christmas trains were made by Scientific Toys so they resembled the Scientific Toys EZ-tec descriptions above. Most of these trains use "hook" or "hook and link" couplers that are more-ore-less compatible with LGB's. The size and height of the couplers may vary between brands, but if you want to mix and match brands, you can usually find a workaround if that causes a problem. All of the trains we are discussing run on track that has the rails 45mm apart (about 1 3/4"). As a result, you can run New Bright trains on Scientific Toys track and vice versa. In addition, they will all run on garden railroad track by LGB or AristoCraft. In fact, they'll all run BETTER on better track. If you stick with plastic track, you'll soon learn that most brands of plastic track don't fasten together. with most other brands of plastic track. If you're fastening your track to a board or something, you can usually get around that problem by cutting off any dohickies sticking off the end of the track, butting the rails up together, and screwing the ties to the board. But if you're just putting together a temporary railroad around the Christmas tree or some such, you'll want to try to stick to one brand of track. 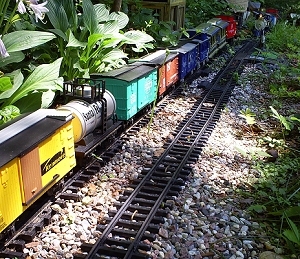 Unlike name-brand garden trains (AristoCraft, Bachmann Big Hauler, LGB, etc. ), the battery-powered, plastic track-equipped sets we described above were not actually made to be used outside. The plastic is not uv-resistant, and the mechanisms are not moisture resistant. However that has not kept many people from attempting to use these sets (or pieces from these sets) outside. Track Life - One surprise is that the black plastic track holds up fairly well outside. I would recommend spraypainting it with gray or rust primer to give it some UV resistance, but several friends have reported using it unprotected for up to three years before it started to get strange. That said, the plastic track turnouts (switches) don't resist the sun's heat well in hot climates - one friend in Florida had his EZ-tec turnouts literally melt down in the sun. Others have told me that New Bright turnouts are even less sturdy. Track Support - Because the plastic track doesn't have big metal rails keeping it straight, you should consider mounting the track to something solid, such as the 2x6 "roadbed" described in our Simple Raised Railroad article. Most of the trains we're discussing in this article come with curves that make a 48"-diameter circle, so you should be able to reuse the same roadbed if you convert to metal track in the future. Consider Aluminum Track - If you plan to stick with battery power for the foreseeable future, you will have better luck over all if you go from plastic to aluminum. If you can go to wider curves as well, such as 8' or 10'-diameter, you will be surprised how well your trains run on it. Dave Knoch, who helped me with information-gathering on this article, converted to aluminum after several years and appreciates the smoother operation and lower maintenance compared to plastic. Robert "Moosie" Taylor, who took most of the photographs for this article, just got a great deal on some used brass track, and he plans to run his plastic-wheeled, battery-powered trains on it as soon as he gets it installed. Again, these trains will run better on metal track (especially wider curves), but I'm not necessarily recommending that you install hundreds of dollars in track to run a $50 train, at least at first. If you stick with plastic track, you probably won't have any turnouts, so you won't be doing any "operations" besides having the train go around the track (or starting and stopping if you have a remote control). Still, most people who have expensive, name brand garden trains run them in circles most of the time, so don't feel too bad about that. If you have a start-stop mechanism, and you want to let the kids start and stop the train at the station, that will give them something to do instead of watching the train go in circles. One thing that really gets most kids involved with model trains is a good set of accessories, such as buildings, little people, animals, street signs, etc., that they can arrange. 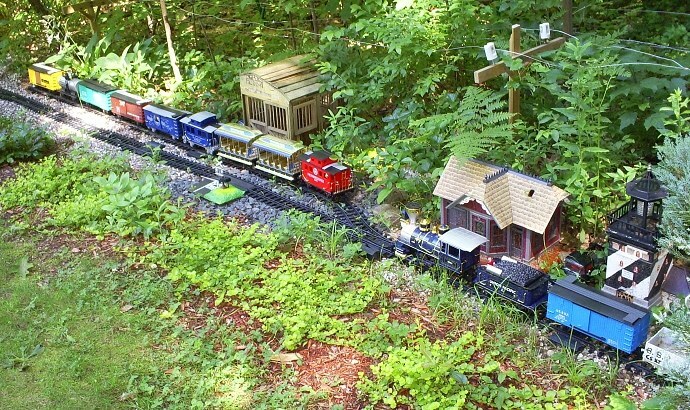 Nearly all accessories that are made for garden trains will work with toy G-gauge trains as well - in fact they'll generally give your railroad a little more "believability," in addition to adding "play value." But you don't have to go with expensive, name-brand accessories. You can also use dime-store farm animal sets, bird feeders, etc. to provide your trains with communities to serve. On the other hand, if you don't mind filing and gluing, the Colorado Structures buildings are a good inexpensive way to get started on attractive, weather-resistant structures that will look right with your trains now and with most fancier trains you might buy in the future. Because you can't leave your trains outside, consider finding a dry, reasonably temperate place to store them and a good way to schlep them in and out. For the Large Scale trains I schlep in and out, I often take them out of the boxes, roll them in fine bubblewrap or soft dishtowels, and store them in those clear 56-quart storage containers. I can take a whole (small) train in and out in one lightweight container, and it only takes me a couple minutes to get them on or off of the track. For trains powered by D or C cells, I would consider investing in a battery charger and a bunch of rechargeables. If you can store that near where you store the trains, you'll be more likely to remember to charge the batteries in between running sessions. NiMH batteries (the kind they use in digital cameras now) are much more expensive than the old Ni-Cad batteries, but your trains WILL run better and longer with them. Ni-Cads will work if you get a deal on them, though. Just be sure to use the appropriate charger - some Ni-Cad quick chargers will make NiMH batteries explode. Some folks running this kind of train make "battery cars" by putting a battery pack into a boxcar or something. Then they figure out a plug-and-wire system so they can just charge one unit (and have one in reserve) to run all of their trains. If you do this with the Bachmann, I would recommend adding weight to the locomotive - without batteries it is almost too light to stay on the track. Dave Knoch has rewired an AristoCraft 4-wheeled "Critter" diesel locomotive to run on battery power, and he uses it to pull his New Bright and EZ-tec cars. About Landscaping, Roadbed, Water Features, Building Lighting, etc. 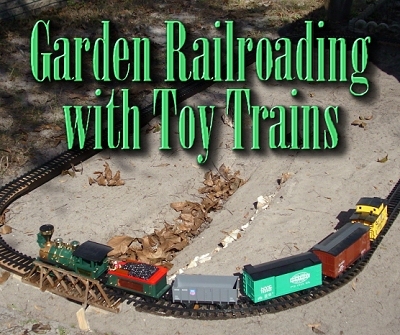 Once you get past the plastic track and the operation and control issues, all of the other aspects of garden railroading are essentially the same as they are for more expensive trains. This can be good or bad, depending on how good you are with a shovel. We have lots of articles you will find helpful, and most of them include hints for saving money when you make your decisions. 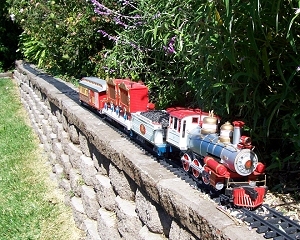 Check out our article on Building A Garden Railroad on a Budget for more ideas. You'll notice that lumber, patio stones, and dirt cost the same whatever kinds of trains you are running. 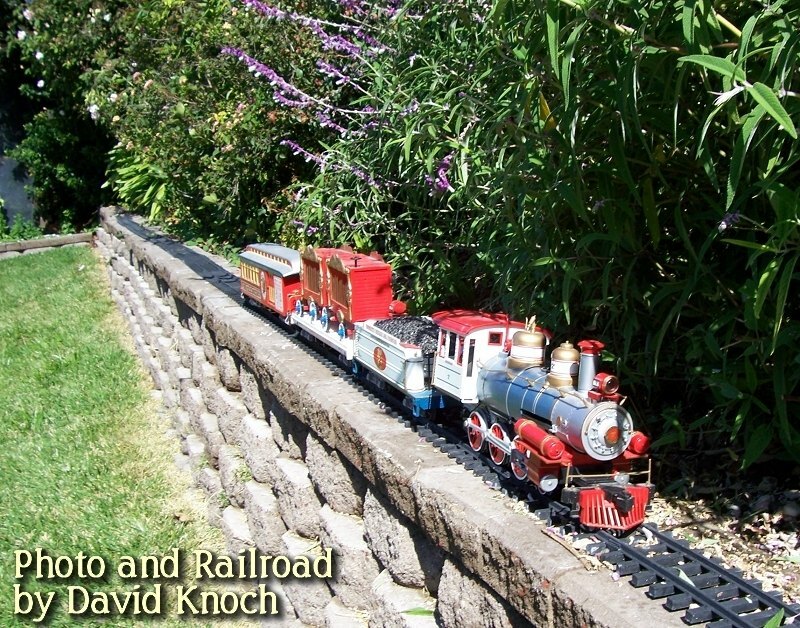 Sadly, I have yet to find many photographs of a well-established, attractive garden railroad using plastic track and battery-powered New Bright or similar trains. That's not to say that they don't exist. But folks running $50 trains often feel a little sheepish showing off their railroads in the same towns where folks are running $2000 trains. If you are running any of the trains on this page, send us some photos and I guarantee you'll encourage lots of other folks who are also either trying to get by on a shoestring or running these trains just because they get a "kick" out of it. I hope this article gives you some ideas and helps you get thinking about Do you have any new finds, techniques or recommendation you'd like to add to our information? If you do, especially if you can come up with how-to descriptions and photos, please get in touch. I'd love to post them here. Update for June, 2009 - Since I posted this article, I've received followup tips-and-tricks from two readers. Hopefully these articles will give you some encouragement or ideas. Some of the notes below were actually received while I was still working on this article, but I included them to show the different approaches and interests people have for these trains. Again, please get in touch if you have any suggestions or questions for any of our other contributors. I would REALLY like a section devoted to both aluminum and plastic track and simple methods to convert inexpensive small engines to battery power. I have converted about 5 engines so far (rather crudely, since I am not an electronics guy--far from it), and they all ran. I would be happy to put in my two cents worth, if it would help. I agree that aluminum track (which I have finally converted to) has the BIG advantage of wider radius curves, altho a lot of us who have a limited budget also have a limited amount of space to work with, so sometimes we have to settle for very tight curves. One BIG advantage of most plastic track systems is the way each piece locks together with the next one. This usually works better than rail joiners. Combining plastic with aluminum or brass is also an option, which I had to do in order to have a crossing on my layout. 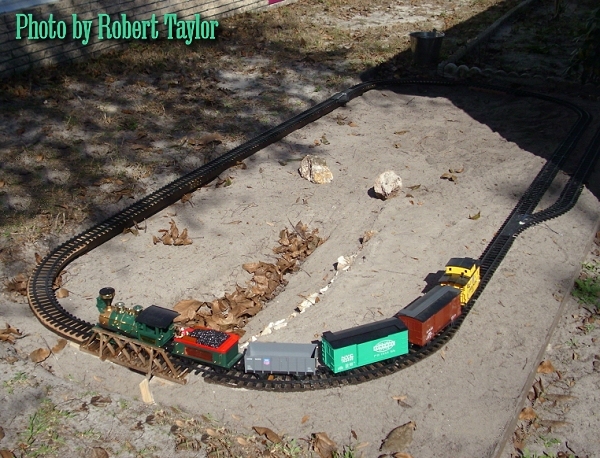 It is not difficult to tie the two together, and even different brands of plastic track can be linked together by making a special piece which puts one type of track on one end and the other on the other, with the two spliced together and mounted on something like bender board to keep it all lined up. Although I have moved up to metal track, I still use my plastic track to run my Bachmann Circus Train on our garden retaining wall! I do recommend using an inexpensive Aristocraft (or similar) engine at the front end, followed by a battery box car, rather than trying to make do with the very inexpensive engines that come in the $29 sets. Give those to the grandkids! (But let them run them on your layout!) . . . I used plastic track for more than ten years in California weather, never painted it, and most of it is still quite usable. It greys a little, but that only makes it look more realistic. Incidentally, I noted that this Christmas (2007), Newbright was again selling their inexpensive $34 sets, battery operated, with quite a generous amount of track. If a person is REALLY on a tight budget, you can build quite an empire for very little money. I do recommend getting a little more durable engine to pull your Newbright cars. I use Aristocraft's Lil Critter and it looks small enough. I picked up three sets at flea markets over the summer. I paid $5 for one box of Scientific toys, $10 for a complete New Bright with Sounds, and $15 for a complete Scientific with Remote. I ended up with 3 engines, 3 caboose, Cabeese ?, 3 Gondolas, and 3 boxcars plus lots of plastic track. First I found out that New Bright and Scientic Toys Track are not compatible, the joiner is on the oposite side. I felt the New Bright was inferior though it did have chuff, Whistle, Bell, and All Aboard sounds. Corny but the kids and cat love it. I sold the New Bright and track and caboose on E-bay for enough that the Scientific Toys were essentially free. I will weight, repaint, weather, and probably add a 9 volt rechargable cell to the tender. This will keep my "G" gauge Jones under control until I see if it's for me. If it is, then I'll probably go Hartland. With the sale of the New Bright I essentially have nothing in this but time. The Scientific runs better and seems more substantial than the New Bright. . . . Like someone else said, for now I'm having fun, and have very little invested into it. Thanks for the forum and this thread. While the weights really do make a huge difference in keeping the Scientific Toys Mogul on track, I've found (in my experience) that it's more important to take the flange off the center driver. The ST mechanism doesn't have the side to side play that better three axle drives have and on the tight radius plastic track, there's a lot of stress on the chassis, which pushes the front driver to walk over the outside rail. It's easy to take down the flange; turn the loco upside down and turn it on. Simply apply a file to the flange and wait till it's even with the rest of the wheel (i.e. track level) or use a Dremel sanding disc if you're in a hurry. As long as the wheels are turning, it's relatively easy to get an even result. I've done this on four or five of these locos and it works better than adding weight (IMHO). Hope this helps. I was wondering if you could update the toy train garden railroad article with 2 newcomers to the hobby you havent discussed yet. Also a correction: The Echo loco is in similar size to a LGB or Bachman model but due to is small, thin cab it looks smaller. 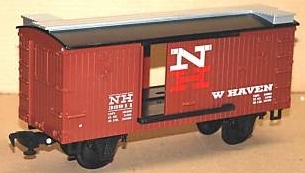 The wagons are about 1:29th scale similar to aristocraft.